As many of you may know, Blogger was having technical difficulties from Wed to sometime on Friday so I was unable to post before Deb and I had to leave for Fresno on Friday morning. I have to hand it to my husband for always coming through with a post for me once Blogger was back up and running. I admit we are all crazy for Brazilian BBQ around our house. It's a super fun way to BBQ for parties too. I know it may seem strange to BBQ using only rock salt but the taste in the end is fabulous and our friends and family love it. In fact we talked about a Memorial day gathering tonight and that's what everyone decided on (who knows, maybe it was the post talking). So on to the post that should have gone up Friday. I am a big stamper...always have been. Even thought I use A LOT of clear stamps, my heart will always lie with red rubber stamps. The image a red rubber stamp gives is always superior to clear stamps yet we all know that clear stamps are much easier to use since you can see exactly where you are stamping. That fact does not deter me in buying red rubber...I guess for me it's more about the strong image than ease of use. On the trip to St Louis I was able to buy a few stamps to add to my collection. Most were red rubber that are not mounted on wood, but with a cling mount. The challenge for some may be, "How do I store them once I get them home and out of the package?" 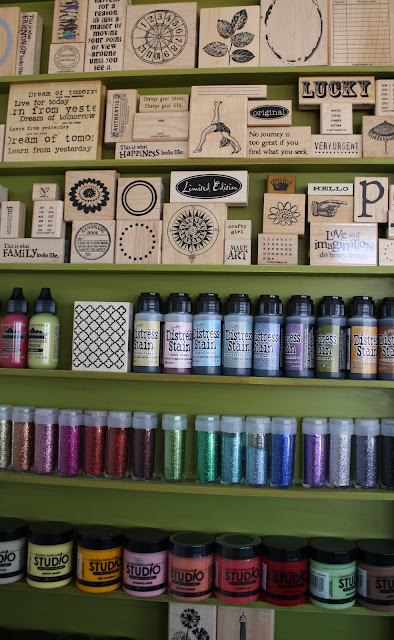 I'll show you how I do it (I am quite sure there are many great ideas out there for stamp storage, but this one works for me). Easy, cheap and accessible is the name of the game here. I got some great stamps at Red Lead, all cling mounted. When I got home I peeled off the backing paper that protects the static cling cushion. Now the stamp is ready to be temporarily mounted on the acrylic block. This stamp happens to be one of Red Lead's custom photo stamps - Dottie and Debbie. Here is the stamp inked up. And here it is stamped on a piece of cardstock...amazing right? When I get a new stamp I always stamp the image on a piece of cardstock so I can see what it really looks like and also to have a sample I can keep for reference. 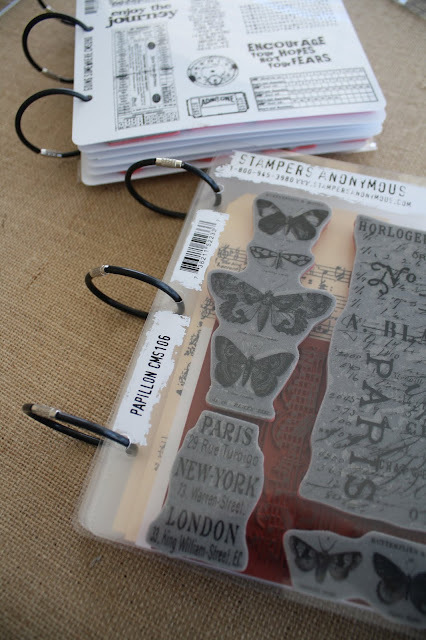 I use the Tim Holtz Unmounted stamp pocket refill pages to store my stamps. Each page is 7 x 8 1/2" and made from a heavy plastic. Each refill page is also a pocket. I take the image that came with the stamp and tape it to the INSIDE of the pocket so I always know what stamp goes in that space. Then I secure the stamp over that image. The image that I stamped on the tag goes inside the pocket so I always have a reference. Again, I cut up the packaging to get the image and adhered it to the inside of the pocket. Love this Statement rubber stamp from Red Lead (4 x 5") - worn polka dot. Both stamped images go into the pocket for reference. Another Statement stamp (4 x 5") - Musical Background stamp from Red Lead. Once I have my new stamps ready to go. I make stacks of pages (5 pocket pages come in one pack for $2.79) and bind them with black rubber binding rings from 7gypsies. As you can see the pocket refill pages are the same exact size as the Stampers Anonymous stamp sets so I can combine these sets with the page I put together myself. 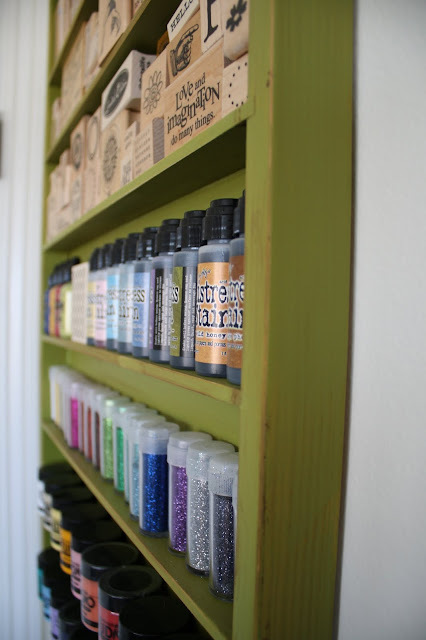 As for my mounted red rubber stamps...I store some in drawers and many that I use frequently are out where I can see them in a shelf unit my husband made me and I painted. It is super shallow and fits on the unused wall behind the door in my work room. This collection rotates in and out depending on what I am into at the moment or the season. I have already asked for a second shelf unit that can be installed under this one. No movement on that request as of yet though. Well I hope this give you some ideas to get your stamps out and organized for very little money. I know if I can see my stamps and get to them easily I am more apt to use them. So glad you are back and sending me more great ideas. Question if you have time...When adding additional paper to layer on a chipboard album (ex. Mykonos in Gypsy Journal) should matte medium be used for everything and sealed also with it? Hope you see this as I am working on one for grad. gift. PS: Really like your shelves. Thank so much for the tips, Paula. I've got mine in old Making Memories binders, but they take up more room and are more expensive...love your ideas and your shelf! Glad you're back! Very clever!! Thanks for posting. I love the look of your shelf! Nothing like being able to see a lot of your favorite art items. Thank you so much for sharing! Great shelf! I'm gonna put this on my husband's "To Do" list. Loved seeing your various ways of storing your stamps, and your great stamps too!